PARENTS at a West Hampstead secondary school which accused police of heavy-handedness two years ago have voted against having an officer stationed on its premises. The ballot took place on Monday when parents and governors at Hampstead School in Westbere Road held a crunch meeting des­cribed by its headteacher as a chance to discuss the “support” of police in the school. Governors have the final decision and are still debating the issue, but if they fulfil parents’ wishes, Hampstead would be the second school in the borough to actively go against the school officers initiative, following La Sainte Union’s decision to go without two months ago. Officers at school gates were introduced in 2002, first at Haverstock School in Chalk Farm before being rolled out to other schools in Camden to ease fears over student safety. But parents at Hampstead say schools need to focus on teaching rather than monitoring children. They argued police were taking on responsibilities that should fall to teachers. Ms Chapman added that she wanted more parents to be involved in the debate. La Sainte Union staff said they didn’t need an officer on school grounds and instead advised that they should be put on the buses where pupils were more at risk. 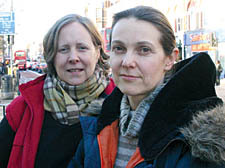 A skirmish outside Hampstead School in November 2006, which involved up to 40 riot police and students, had given the police a bad reputation, said Ms Chapman. She also complained that local police – who were not involved in the incident – had failed to address the issue or to apologise. The Independent Police Complaints Commission is investigating the incident after headteacher Jacques Szemalikowski lodged a complaint about police heavy-handedness. Chairman of governors Geoff Berridge said a further meeting would be held on February 7 to discuss the future of a police presence at Hampstead. He added: “Having a police officer at the school is the status quo, but given the amount of parental concern we have decided to talk about it. The document that describes what a Safer Neighbourhoods Support officer does could be changing. Mr Szemalikowski was unavailable for comment.